Over the past 20 years, the ways in which content has been distributed have completely changed. We’ve moved from huge portals of information, to single webpages, to lightweight apps, to little notifications on your mobile homescreen. Notifications work best when the notification is the message. If the ways in which content is distributed have changed significantly, you could safely assume the ways in which we create content would have changed too. That’s actually not the case. When it comes to creating new formats like notifications, we revert to the old paradigms of creating content. For such a new technology, notifications have become real bland, real quick. It’s no wonder notifications are considered the telemarketers of the 21st century. Impersonal, irrelevant and poorly timed, they’re usually treated as a badly executed marketing strategy, rather than a publishing channel in and of itself. Notifications can, however, be an extremely effective vehicle for content – it simply needs a publishing strategy that best fits the medium. Here’s a few ingredients your push notification strategy should include. Despite the incredible amount of mobile usage, most forms of content are still closely tied to the rhythms of the desktop computer. Newsletters arrive at 9am, blog posts are published at 5pm. These publishing schedules have long worked for traditional types of media, but don’t automatically translate to notifications and mobile. Andrew Chen has pulled together some excellent data which shows that while brands are sending a ton of pushes leading up to the evening (and dropping off quickly after), open rates are actually higher after 6pm. The data is clear – send push notifications between 6-8pm when engagement is at its highest. Note: 6-8pm should only be taken as a rule of thumb. The timing of your push notification should also incorporate the urgency of the message. In this case, it’s worth creating a simple notification map which matches each notification with the right priority. With every iOS and Android launch, you’ll hear companies proclaim a new dawn of interactive notifications. “Images and gifs increase CTR by 60%” goes the press release, along with a few other vanity metrics. 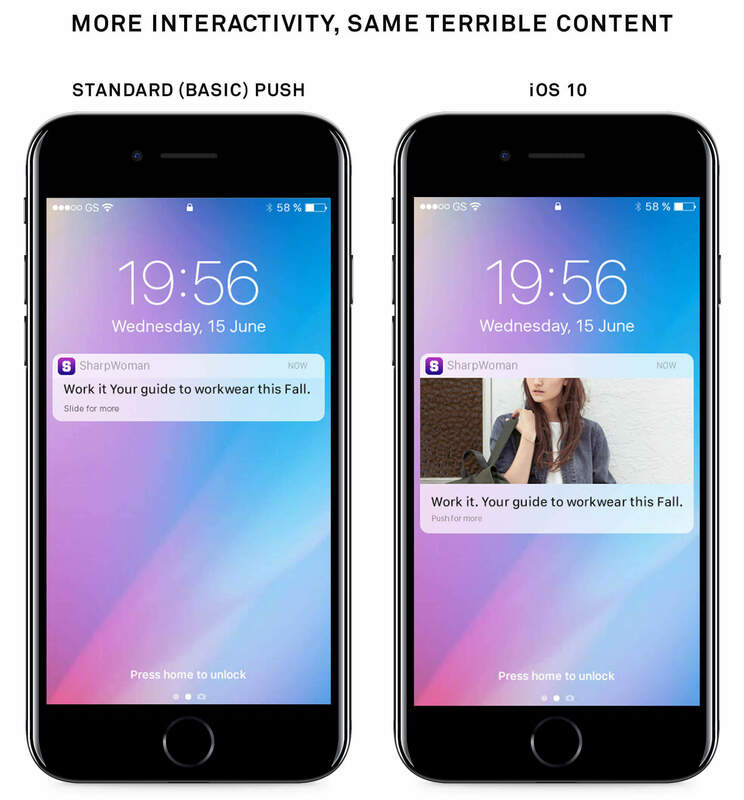 But interactive notifications mean little if what you’re communicating is of no value to the user in the first place. Most businesses continue to use notifications as a signpost – a piece of vague, cryptic content to try and entice you back into the app. But notifications work best when the notification is the message. Notifications work well as an entry point for more detailed information, but only when the original message has done enough to warrant further investigation. It starts with unlearning most of the tactics you’ve learned about marketing best practices. So much of our mobile homescreen is built around personal interactions – social notifications from friends, message notifications from family, etc. 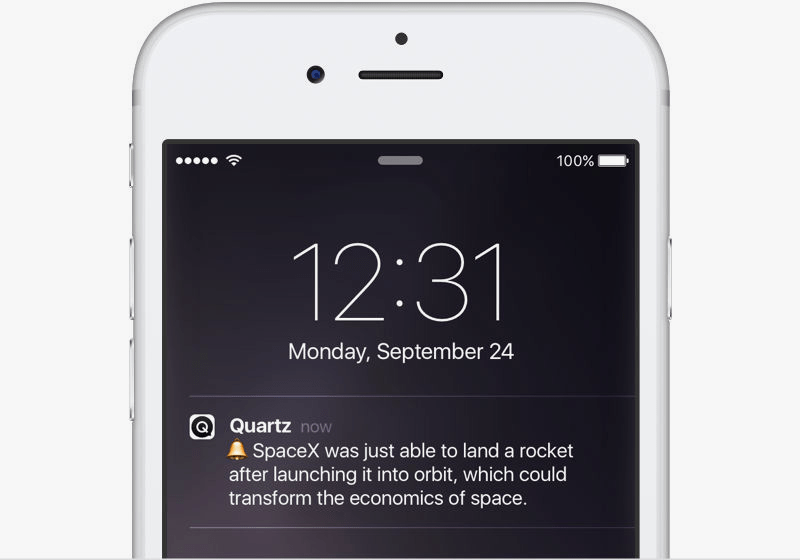 In order to compete with notifications that are personal to the user, notifications from brands must follow suit. Even small details, such as adding the receiver’s first name, can help push notifications perform better (in some cases up to 4x better). One of the biggest issues facing notifications is that their content is essentially ephemeral. Once it’s sent, it has no way of adapting to new times or contexts. Some publishers are doing incredible work designing notifications that automatically update as new data becomes available. It means you’ll only ever get the most timely and accurate content delivered to you. 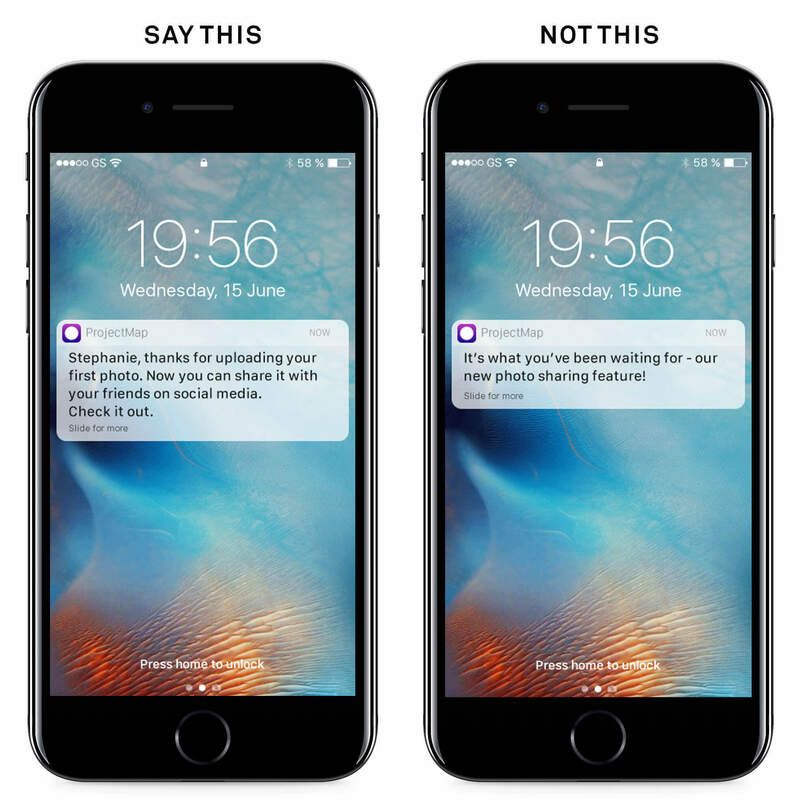 These sort of real time adaptive notifications might be beyond most brands right now, but there’s a salient point to be taken away – push notifications with current, immediate information get the highest engagement. News that affects your plans and decisions in the real world (think Uber surge pricing notifications), fleeting opportunities someone is likely to take advantage of (such as price drops on Amazon), and status updates about content they’re monitoring (new arrivals on Netflix, for example) are notifications most likely to be seen as welcome interruptions. Traditionally, push notifications have been measured by metrics such as open rates, click through rates etc. These glass-half-full metrics only tell half of the story. For example, a successful push could be a self-contained, standalone message, as discussed above. If people don’t click through, it could mean the push didn’t engage them – or that it performed its job. Click-through rates and open rates are great for impressing your colleagues, but not so great at helping you understand whether users are getting the information they really need. These are just five ingredients you should be grappling with before you start sending push notifications. And it starts with unlearning most of the tactics you’ve learned about marketing best practices, and creating some new tactics based on some of the above. If you have other techniques for sending push notifications like this, or if you’d like any more details about any of the above, leave me a comment below or get in touch through the Messenger on this page.